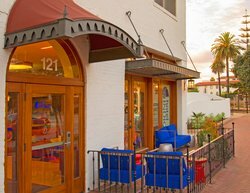 Take a visual journey through Hotel Indigo Santa Barbara, a premier art hotel with car-free travel perks and exclusive packages to enhance your trip. 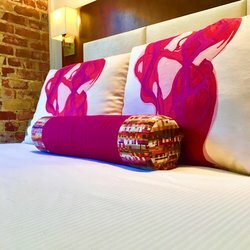 Ideal for travelers looking to drop their bags and go, stay where the action is here in the revitalized warehouse district known as the Funk Zone. We’re just steps away from the Urban Wine Trail, Stearns Wharf, and delicious restaurants in Santa Barbara. 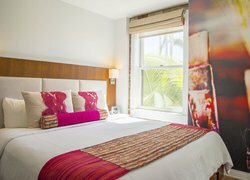 Whether you’re interested in local galleries or outdoor adventures, our hotel is ideally located for everywhere you want to go. 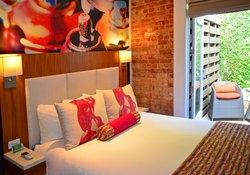 Our contemporary hotel has been designed to include the amenities our guests want and none of the additional fluff. 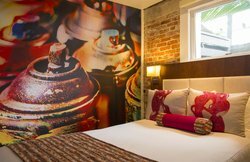 Sleep soundly in one of our 41 micro hotel rooms, complete with home comforts such as Keurig Brewers, complimentary Wi-Fi, and stylish furnishings. 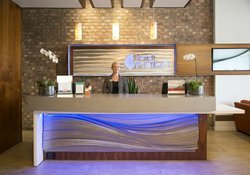 Also included in your stay is access to our 24-hour business center, fitness studio, and open-air lounges to gather with friends. Enjoy a fresh breakfast, outdoor lunch, or evening meal at our award-winning restaurant, Santo Mezcal, for a twist on traditional Mexican cuisine. 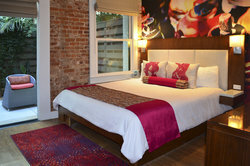 Browse through our gallery to see Hotel Indigo Santa Barbara for yourself.